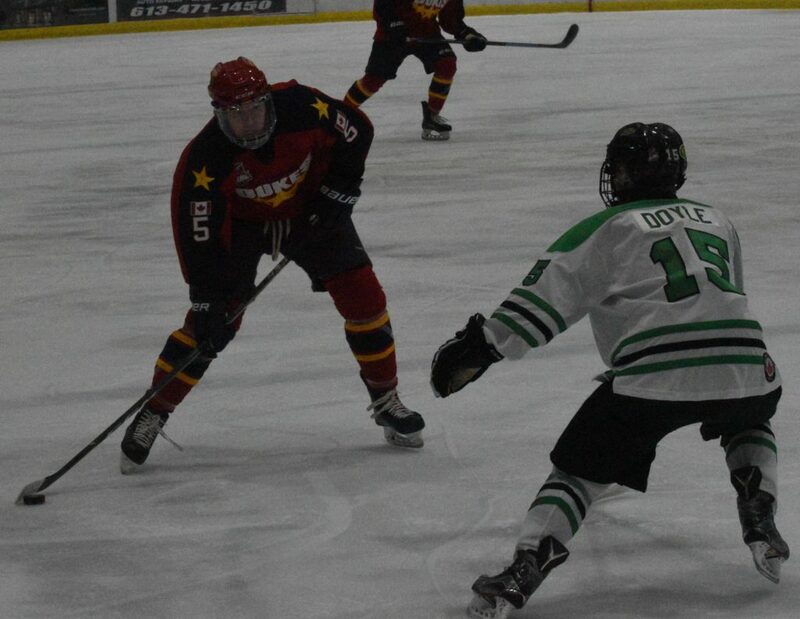 Wellington Dukes fans can be thankful for a couple of new blue liners and an order of redemption that were part of a successful holiday weekend. 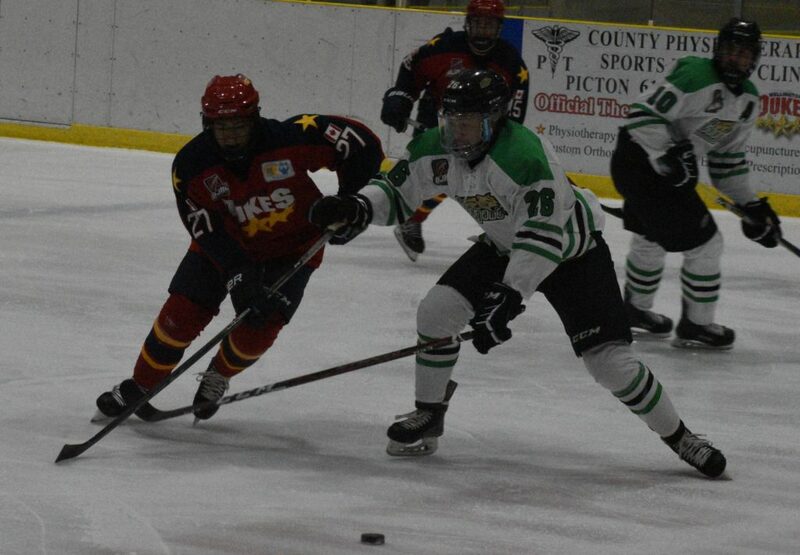 After dropping a 3-1 decision to Cobourg on Friday night, the Dukes took their act on the road and managed a pair of clutch victories in Aurora and Toronto to salvage the weekend and get back into the race in the Ontario Junior Hockey League’s east division. After adding Quinn Hanna from the Quebec Major Junior Junior Hockey League earlier this month, General Manager Todd Reid has bolstered the club’s beleaguered blue line and added former London Knight Tim Fallowfield. 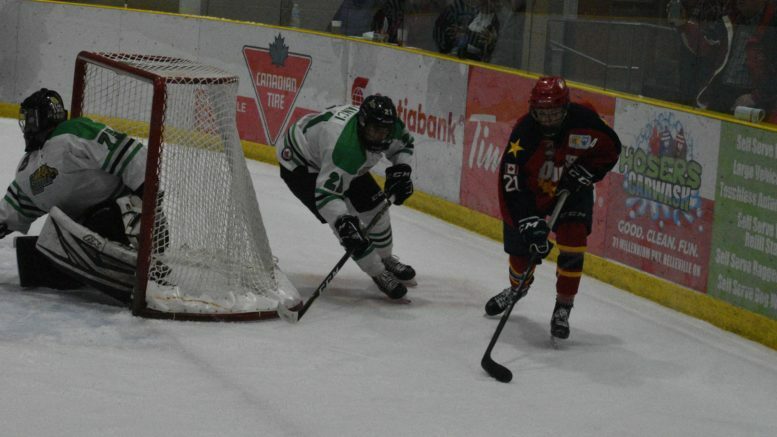 The St. Thomas, ON native was in the lineup for all three games this weekend and made an immediate impact, picking up a game winning goal and adding a key assist in Wellington’s two victories. With the two-out-of-three weekend, Wellington moved their record to 7-5-, good enough to 16 points and a share of the division lead however their co-leaders, Cobourg, had four games in hand entering play Monday morning. Wellington’s latest victory required a comeback and overtime but the locals were able to shade the host Toronto Jr. Canadiens 4-3 on Sunday evening at the Scotiabank Pond. Wellington was forced to play catch up all game long and didn’t lead the Baby Habs until Dan Panetta collected an Elijah Gonslaves feed at 1:14 of the extra session and blasted it through Toronto starter Christian Mattiace. Trailing 3-2 with under two minutes left in the contest, Wellington was able to force the issue late with starter Olivier Lafreniere pulled for an extra attacker. Fallowfield and Hanna would draw assists on Dalton Bancroft’s second of the campaign with just 90 seconds left to tie it at 3-3. The line of Andrew Rinaldi, Tyson Gilmour and Gonsalves had both of Wellington’s first two goals. After Toronto scored the game’s opening goal in the first, Rinaldi played trigger man at 5:45 of the second period to tie it 1-1. After Jason Pineo scored a powerplay goal at 10:22 to push the hosts ahead 2-1, it would be Gilmour bagging his second goal in consecutive games to tie it back up at 2-2. In the third, Eric Ciccolini picked up Toronto’s second powerplay goal of the game just over five minutes into the third to give his team a lead and set the stage for Wellington’s late game comeback and eventual overtime triumph. On Saturday, there would be much in the way of dramatics as the Dukes whitewashed the host Tigers 3-0 on the strength of Lafreniere’s 28 save shutout. After a scoreless first where Ollie the Goalie was tasked with making a few big stops, it was Hanna and Fallowfield playing pitch and catch on a Wellington powerplay before Fallowfield unleashed a howitzer that sailed into the net behind Tigers starter Jack Irvine at 12:02 of the second. In the third, Wellington would add some insurance as Gonsalves and Gilmour would make a couple of nice passes in the corner before Gonsalves would spot Rinaldi at the side of the Aurora net just 4:13 into the frame. In the later going, Gonslaves would come back to haunt his former club further when he set up a streaking Gilmour. This corner has been loath to compare Gilmour to his NHL-playing patriarch and for good reason as any description would set unfair expectations upon the affable young man. But perhaps on Wellington’s final goal of Saturday night’s contest, a comparison to one of Doug Gilmour’s Toronto Maple Leaf teammates could be considered? In a Glenn Anderson like fashion, Gilmour took Gonsalves’ chip pass at the blue line and busted in on Irvin, driving the puck, himself and the netminder into the Aurora cage for what Tigers play-by-play man Kevin Dean described as “the nail in the coffin” of the hosts on Saturday evening. It was a far more energetic and lively Wellington squad than a night prior when the club seemed to sleep walk through several portions of their 3-1 loss to visiting Cobourg. Wellington fans were just taking their seat when George Miranda busted into the high slot and beat Lafreniere high seven seconds into the first period. Wellington had a couple of chances to get the equalizer later in the first but Cobourg starter Dershahn Stewart and the posts and cross bars worked to stymie the Dukes and helped the visitors escape with a 1-0 lead. Early in the second, Adam Keyes picked up a loose puck to Lafreniere’s right and batted home a powerplay goal to make it 2-0 in favour of the Cougars. Wellington was able to interject themselves back into the game at the midway point of the second stanza when Keenan Eddy was able to force a turnover down low and set up Rinaldi at 11:58 to make it 2-1. But Wellington again had trouble starting in the third period and it was Miranda victimizing the Dukes just 1:07 in to make it 3-1 and a lead that the Dukes would not overcome. Wellington will travel to Newmarket on Thursday night to play the Hurricanes before welcoming the up-and-coming Whitby Fury to Lehigh Arena on Friday.